Tutti Designs: Ice Crystal Fir Tree. Pam here today as it`s Wednesday.. Sharing A Christmas card with you today! 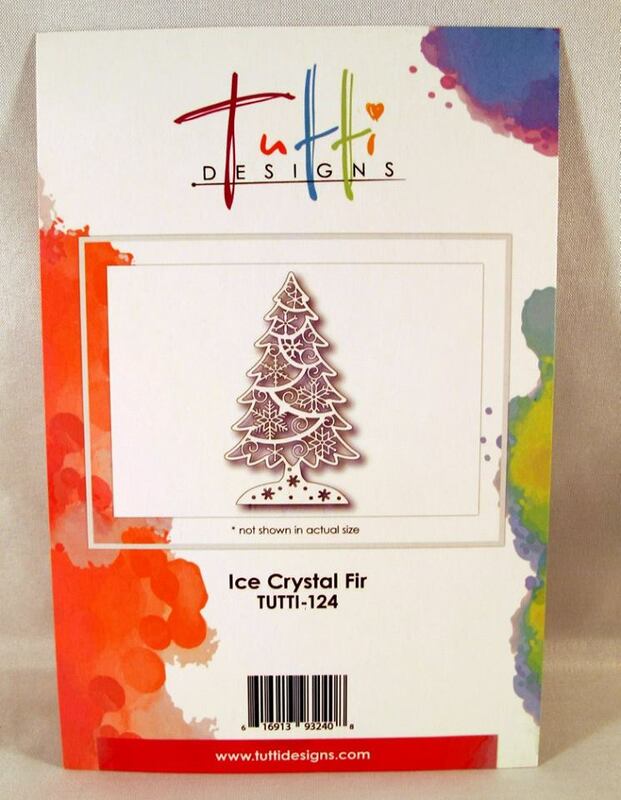 I have used the "Ice Crystal Fir" die .. From July Release. Beautiful die! you could just use this on it`s own.. I have layer up and bling!!! I wanted to create snow on the swags on the tree design, for snow I use "Cosmic Shimmer" dries White pva glue, this glue dries in the shape you put on! excuse my years old bottle.lol. Next sprinkle Snow Dust or Flower Soft..DO NOT shake off the glue or patt on.. leave to dry..result on the left.. This is he finished tree.. I cut a green to to create a shadow effect.. blinged up with gems. I created a background with distress inks..stamps from my stash! with white embossing powder.. This was layered up with Red & Silver glitter card, white card mat in-between. Card size 7"x 5.1/2" finished. Thank you for stopping by will see you next week. Love the frosty look of the tree. I love how you used the Cosmic shimmer and glitter. Will have to try that. Gorgeous card. WOW! How'd I miss this ... oh yea day of my granddaughter's surgery! Still no excuse lol! This is gorgeous ... I love that you 'shadowed' the tree then added all the snowy goodness. BEAUTIFUL creation Pam! Fir Trees Arch Scene, a lovely Christmas Scene. Bright Candles with Arched Fir Branch. Decorated Christmas Tree with a vintage style. There's always HOPE . . .
Tree Of Life In A Frame.